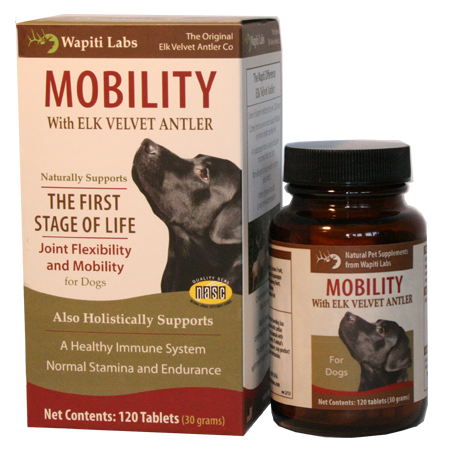 Senior Mobility Supplement for Dogs | Elk Velvet Antler | Wapiti Labs, Inc.
Trial Packs are a great way to try our products. We have specially sized them for small/medium dogs (7 tablets) and large dogs (12 tablets). We can offer trial packs when many others cannot because the components in EVA work synergistically, absorbing quickly into a dog’s body. Our products also require only once-a-day dosing and no long load times! Natural Mobility enables my dog to run like a cheetah. My 14 year old border collie/ rottie mix, Mariah, does wonderful with senior mobility/ longevity! Her joints were in great shape 3 years ago when I adopted her and I was looking for a way to help keep them in shape. She has a lot of digestive issues and allergies. Most natural hip/joint supplements cause her to throw up. She has never had any issues with this! Her joints are just as healthy at 14 as they were when I first adopted her! She is still able to run up and down stairs, jump onto the bed, and gets in the car with ease! Thank you!! Our dog can only take these, because of his allergies. Five of my seven dogs are seniors and four of them are feeling the effects of time. The family matriarch is Chloe, a Standard Poodle at 15+ years. She is taking an anti-inflammatory and it helps but she was having a real problem with stairs – going down more so than going up. There was lots of coaxing and drama and I finally resorted to carrying her, but she didn’t like that either. I was doing that for a few weeks when I ran across an ad for this and decided to try it. The morning OF THE THIRD DAY I carried the two aging Shih Tzus downstairs, turned around and Chloe was standing right behind us! No coaxing, no drama, no kidding. I never expected results that quickly. I’m not saying that she acts likes she’s six again but she is definitely having an easier time coping with everyday life. I’ve seen an improvement in each dog using this but hers is the most remarkable. If you might be hesitating due to the cost, let me tell you that you use the tiniest amount so it will last you a long time and the company provides you with a teeny measuring scoop to make dosing easy for you. We experienced very positive results and hope you do too. I got this for my dog who was limping because of his love of chasing ball. We had tried other things and then I remembered that Elk Velvet Antler was good for inflammation. I ordered this formula and within 2 or 3 days he stopped limping and is back to playing ball. I will continue to use the product because of the wonderful improvement I saw in my dog. Worked wonders for my dog! My dog is a 3 1/2 yr old toy aussie. While barking out the window one day she had slipped and fell between my night stand and bed. A week later I noticed her leg kept popping out of joint and I assumed it was from the fall. Took her to the vet only to be told it’s common in dogs and there’s nothing to do for it that isn’t extreme. I went to a dog event the next weekend and stopped at the Wapiti Labs booth where I told them what was going on with my dog. She suggested giving her the Senior Mobility tablets, which I did for the next month. Noticed improvements right away and have continued the supplements ever since. My dog has not had a problem again with her leg popping out of joint! Niki our 8 yr old CKCS was born with hip dysplasia. She is overweight due to her not being able to get normal exercise such as daily walks. We have her on weight control food and she has been taking Senior Mobility for a couple months now. Seeing the ad for natural pet supplements using Elk Velvet Antler from Wapiti Labs has been the answer to our prayers. Within just a few weeks, we began to see improvement in her ability to get around. She hasn’t lost weight yet so we know it’s the Elk Velvet Antler in the Senior Mobility that is helping her mobility. Thank You for this wonderful product! My vet recommended I use this in combination with other stuff for my dog who was limping and had trouble with her elbow at the age of 1 year. After three vets, multiple tests (which aren’t cheap) and the feeling that I didn’t want my dog to have surgery (plus not a lot of confidence in what I was hearing), I decided to go with this combination the vet suggested and wait a few months to see what happened. Much to my surprise and happiness, my dog is no longer limping. I know. Doesn’t make sense. But I’m a believer. This dog is a young healer and playing chuck-it is her life. She runs, jumps, plays: no limp. The last vet I’d gone to told me that after her exam she shouldn’t ever run, hop or jump much…. “like ever?” I asked. Right. Well, that’s not going to happen. My recommendation for anyone with a dog like this is to try the Wapiti Labs with Elk Velvet Antler and give it up to 3 months. Moderate your dogs activity a bit and see what happens. You might be impressed as I was. Recommended by my dog’s chiropractor. Our 15 yr old Dal has lots of spinal problems. It took longer than the week the product claims, but I do see a difference in her mobility and energy level. She no longer moans & groans when laying around and has been “running” with the other dogs a little bit. My vet surgeon recommended this product for joint support. She is a professor at OSU in Corvallis, OR. He is just a little guy so I give him a quarter of a tablet a day. My 12 yr old labs hip discomfort is greatly relieved, one given in the am, the other in the pm. I have 4 very senior dogs. This has helped their joints so much. I love it. I use this product for my rescue dog who has three legs and back issues. My dog (we think) sustained an auto accident which broke his front right elbow and was the cause for the leg removed as he was in awful distress . I added this supplement just to see if he could feel a little better. What a difference! He is much more playful and less grumpy. He is playing with my other 2 year old rescue dog much more and running at the dog park more. Do take a moment and read the interactions on the bottle and note what kind of meds your dog is on and always check with your vet when adding a new supplement. I ordered this for my pug mix. She is 7 years old, kind of fat, had a knee problem a few years ago. She loves being active but for a while she was limping and so stiff we couldn’t even go for walks. I started her on glucosamine which stopped the limping but she still had a hard time going for more than 10 minutes at a time and would be very stiff after a play sessions. I ordered this product hoping it would give her a little bit more flexibility and reduce swelling in her joints. She has only been on it for a week or so now but I swear I can see a difference. She is able to keep up on our walks and doesn’t show stiffness afterward. The powder is also very easy to feed, I just sprinkle on her food with a splash of water and stir it around and she doesn’t notice a thing. My dog is good as new! This stuff is awesome. I started taking it too and I feel really great too! A cousin recommended this product to us in October. We purchased Senior Mobility for our 12 1/2 year old English Springer Spaniel. Annie has severe stiffness issues and has been on several various medications from vets. They all had negative effects on her, hence, we were thankful to find this natural product. It has helped her immensely for which we are extremely thankful. I just bought this for my favorite sister Beth’s black lab Chinook. She is 13 1/2 and probably on her last year. Both my dog Tux & I are on Wapiti products and I only hope that Chinook will respond as positively as we do. Can’t wait for my sister to update this review and tell you how much Chinook has life has improved and and a smile brought back to her lovely face! I seriously can’t wait! Will keep you posted. Update, on Chinook. I got an email from Wapiti and they wanted to know more about Chinook before they sent the order. I called them & then my sister and described the differences between Mobility & Senior Mobility which is ginseng and it can create heat which helps give energy. So glad they took the time to make sure the order was the right product for the dog…who does that any more?!! My sister told me that the heat might swell her larynx and that she is taking special medicine for that. So I called back and switched to Mobility for Chinook and a gave a big thank you to Kaurie & Beth at Wapiti! from Susan Vanecek: Our sweet girl Charlie shared her life with us for 17 years and nearly 3 months. She was an Australian Shepherd Mix weighing approximately 45 pounds. We were thrilled to discover your Senior Mobility supplement. It became a part of her daily routine for the last 2.5 years of her life. She loved to walk and be outdoors. Senior Mobility contributed greatly to her quality of life and is so reasonably priced! Your product has made such a huge difference in my aging dog, I adopted him as a puppy who was almost starved when found so has had a slow start. I am so thankful for your company. Sunny turned into a puppy again with Senior Mobility. He was incredibly active and seemed less stiff. Even his doggie daycare thought he was a different dog! While I was working at a pet food store I was introduced to Senior Mobility with Elk Velvet antler for older dogs. Chicha was about 13 then and slowing down with walking and getting up from laying down, I thought it was worth a try. Within less than a week of taking the tablets she was like a new dog. I was surprised at how energetic and playful she had become. She was a completely different dog who was brought backwards in years. I started recommending the product to other customers in the store. I believe she gained a few more years from being on this incredible tablet! I started recommending Wapiti Labs Senior Mobility (even for young dogs) after a patient that I saw who wasn’t responding to any other joint supplements. I had seen an article on the benefits of elk velvet supplements in this area. After seeing such wonderful results I started recommending it as my primary recommendation for 2 reasons: the patients respond very quickly (within a week vs 4-8 weeks for regular supplements) and the response is quite dramatic for most. I have been very happy with this supplement and of course use it in my own elderly and my young agility dog as well. Of course, after seeing such great results and not being as satisfied with my own (name brand) glucosamine/chondroitin/MSM supplement I had to try their Velvelife for myself. My knees not only felt better but my back as well. As an added benefit I have not noticed progression of my vascular issues (spider veins) since starting.